This is a cool poster for dorm rooms! Literally! This dorm essentials item features plenty of ice and snow to make your college dorm room room quite cool. This college supplies item is nice to look at, but you probably wouldn't want to be in a cave of ice. This dorm essentials item will be an amazing addition to dorm room decor. The cool white and blue colors will blend nicely with other dorm room decorations without overpowering your college supplies. After all, you want to create a complete look for your dorm room decor and not have your college posters being the centerpiece. Our Ice Cave Horizon Poster for Dorm Rooms has an amazing scenic view that will add interesting college wall decor to your dorm necessities. This dorm wall art item features a photograph taken inside of an ice cave. Of course, it is more than just that. Bordering the top and sides of this dorm essentials item are white icicles and beyond the cave is blue water and ice. The backdrop is gorgeous with a sky that has hints of lavender, orange and pink. 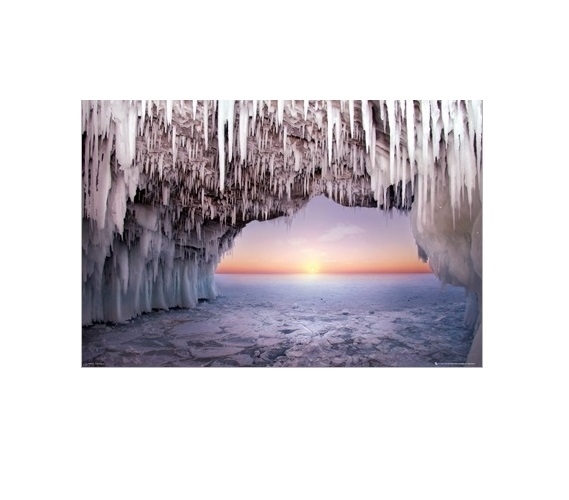 Complete your college wall decor by placing beautiful dorm wall art items like our Ice Cave Horizon Dorm Room Poster on your dorm walls!